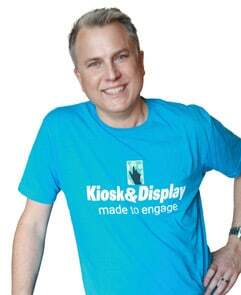 Kiosk & Display is leveraging 13 years of interactive kiosk and digital signage experience into new channels to provide clients with a holistic and integrated approach to creating, producing, managing, scheduling and distributing digital content across all screens. With the introduction of “Multichannel Messaging”, K&D now has the ability to be a one-stop resource for busy marketers as they try to grapple with the complexities of consistent digital messaging across all their platforms. That’s where K&D comes in. Our designers and technicians are trained and experienced with all types of display devices and know how to manipulate a message across the entire spectrum. But K&D can give you a deal. To celebrate our new capabilities, we’re offering a free analysis of your needs combined with a detailed, flat-rate proposal to take care of them for you. Getting started is simple: send us a list of sizes and formats of your digital messaging needs along with the desired frequency of updates for each screen. We’ll respond quickly with a no obligation proposal to handle the entire process for you… or any step of the process that you want to outsource. And, all new client engagements include time invested by us to get to know your brand thoroughly and to represent it within your guidelines. What are you waiting for? You don’t have to be a K&D client to get started. Give Jon a call today at 800-724-8947 to learn more or to get your proposal started. With K&D’s help, you’ll be sure everyone gets ALL your messages.